James Jeffery Peoples, Trivedi Global Inc.
Sambhu Charan Mondal, Trivedi Science Research Laboratory Pvt. Ltd. 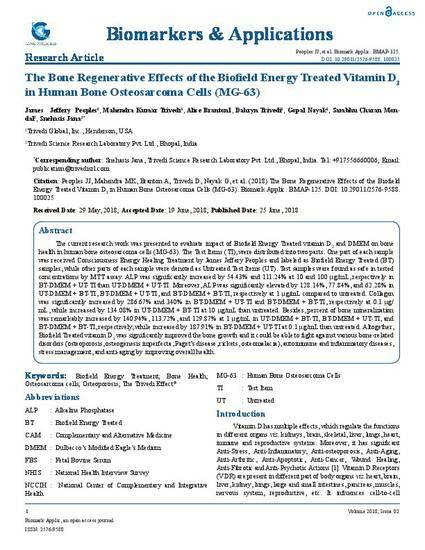 The current research work was presented to evaluate impact of Biofield Energy Treated vitamin D3 and DMEM on bone health in human bone osteosarcoma cells (MG-63). The Test Items (TI), were distributed into two parts. One part of each sample was received Consciousness Energy Healing Treatment by James Jeffery Peoples and labeled as Biofield Energy Treated (BT) samples, while other parts of each sample were denoted as Untreated Test Items (UT). Test samples were found as safe in tested concentrations by MTT assay. ALP was significantly increased by 54.43% and 111.24% at 10 and 100 µg/mL, respectively in BT-DMEM + UT-TI than UT-DMEM + UT-TI. Moreover, ALP was significantly elevated by 128.14%, 77.84%, and 62.28% in UT-DMEM + BT-TI, BT-DMEM + UT-TI, and BT-DMEM + BT-TI, respectively at 1 µg/mL compared to untreated. Collagen was significantly increased by 286.67% and 340% in BT-DMEM + UT-TI and BT-DMEM + BT-TI, respectively at 0.1 µg/mL, while increased by 134.08% in UT-DMEM + BT-TI at 10 µg/mL than untreated. Besides, percent of bone mineralization was remarkably increased by 140.94%, 113.72%, and 129.87% at 1 µg/mL in UT-DMEM + BT-TI, BT-DMEM + UT-TI, and BT-DMEM + BT-TI, respectively, while increased by 187.91% in BT-DMEM + UT-TI at 0.1 µg/mL than untreated. Altogether, Biofield Treated vitamin D3 was significantly improved the bone growth and it could be able to fight against various bone-related disorders (osteoporosis, osteogenesis imperfecta, Paget’s disease, rickets, osteomalacia), autoimmune and inflammatory diseases, stress management, and anti-aging by improving overall health.